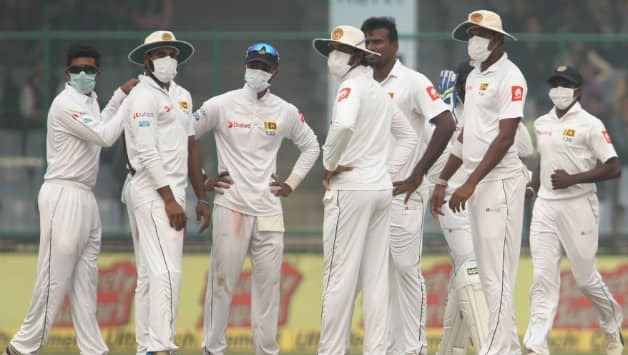 Kolkata, Dec 4: West Bengal Chief Minister Mamata Banerjee on Monday said she was "ashamed" at seeing the Sri Lankan cricketers wearing pollution masks while playing against India in New Delhi. "It's not a good scene that a visiting team is playing an international game wearing masks. Pollution is worsening everyday. This is not earning a good name for the country. I think Delhi must control pollution. Delhi must sit together and decide on it (pollution issue)," Banerjee told reporters. Banerjee underlined the pollution issue being a grave one in the national capital. "I felt very ashamed otherwise I would not have said this...This is not a political issue but a genuine issue," Banerjee added. The second session of the third and final Test match was halted for few minutes after concerns over the poor air quality here on Sunday. The visiting Sri Lanka players wore masks while fielding after the lunch session on the second day at the Ferozeshah Kotla. As the Delhi air quality deteriorated and it became hazy just after lunch, umpires discussed the issue with the players and the match was halted for around 15 minutes.